It does not look like a typical blog. Although the owner/creator called it a blog, it is an online book with six chapters covering the contexts of capitalism, work, relationships, self, culture, and curriculum. It sounds interesting since these contexts are relevant to our daily lives. The home page is very clean and elegant. Each chapter comes with clickable index of topics. There are many section topics in each chapter; for example, there are 86 in Chapter 2 Work. Each topic is an independent blog post coming with context and photos. Many of the context in the section topic addressed concerns of our societies and public opinions. For example, in one section of Chapter 2 it discussed that "We live in a culture that is very impressed by youth. We’re constantly reminded of why it’s nice to be young and rarely encouraged to dwell on what might be appealing or interesting about getting older." The blog page text has the appropriate font size, line space, margin, and color. It is free of advertisement across all pages. Overall, it is a well-designed and well-written online book. the .org domain name indicates it is not for profit. This blog is on WordPress with a custom theme. The title, tagline, and description are set as "The Book of Life - Developing Emotional Intelligence - The Book of Life is the 'brain' of The School of Life, a gathering of the best ideas around wisdom and emotional intelligence." A blog as a online book is very unique. Although there are many blogs addressing topics related to emotional intelligence, delivering the topic as an online book gains the competitive edge. The USP also on its advantage over conventional books. The online book format allows easy and frequent update and expansion, which can draw readers back to read more, this potentially generate more repetitive customers. The blog is a marketing tool. It does not make money directly, but direct people to the products of The School of Life. 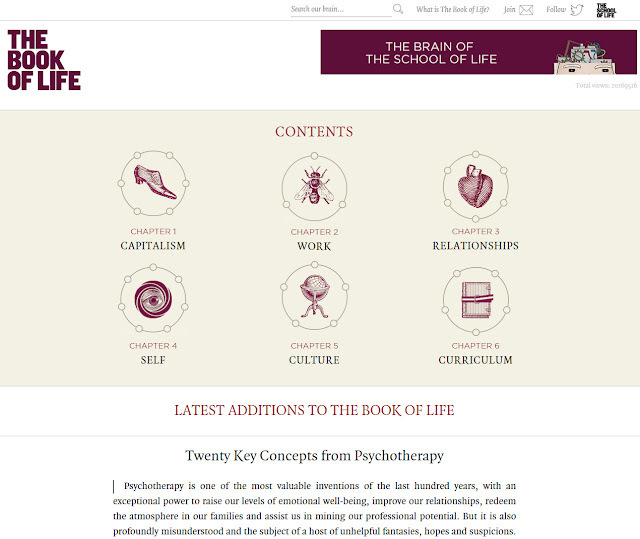 On top of the home page and chapter page, there is a banner "The Brain of The School Life" for the corporate website. On the bottom of the page, there is a big-font message saying "If you’ve enjoyed reading The Book of Life, please join our mailing list and we’ll keep you in touch about the latest sections of the book and news from our sponsor, The School of Life:" The sponsor referred here is actually the owner of the blog (book). The social media marketing is focused on Twitter in which there are 134k followers. The main promotion is occurred on online presence, search engine, and people referrals. This blog provides a collection of well-organized knowledge updated consistently, making it worth bookmarking. The topics and contents are interesting enough for social media sharing. Thus no wonder, a lot of pages from this online book are shared across social media. That is exactly what the marketing team aims to achieve.